6 Easy Steps to join the HandMAKE My Day Cbus Movement. No 2.) 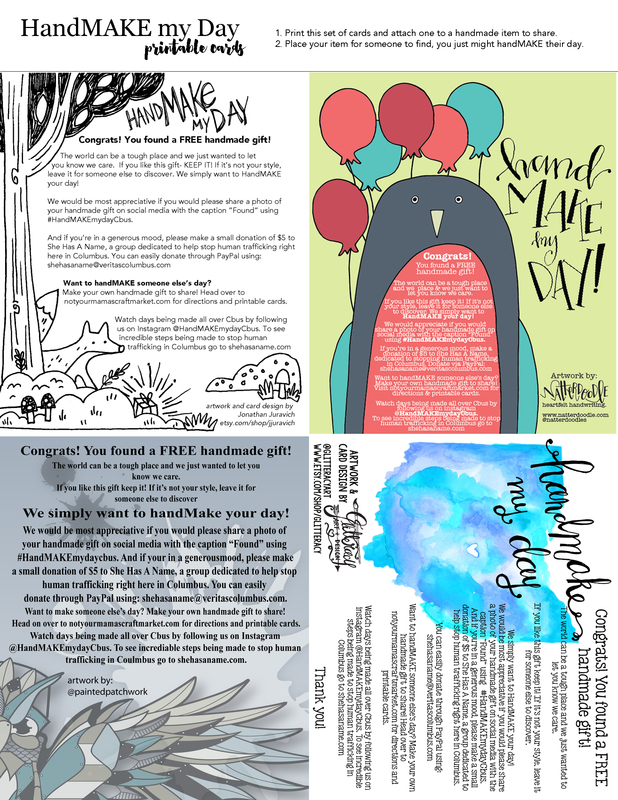 Print off your favorite Congrats Card: HERE and attach it to your handmade gift along with any contact info you would like to share. Your name, email, website, handle. Your choice! No 3.) Find the perfect spot to hide your handmade gift. Parks, sidewalks, restaurants, shops, bus stops, you name it! Just remember to “hide it in plain sight”! No 4.) Instagram a photo of your handmade gift using #HandMAKEmydayCbus and the caption “Find me, I’m Free!”. Include a clue or two as to where it can be found. Also use #SheHasAName to encourage support and awareness of steps being taken to fight human trafficking in Columbus. No 5.) Sit back and follow us on instagram @HandMAKEmydayCbus and at #HandMAKEmydayCbus to see whose day you made. And while your waiting, check out @SheHasAName and learn about the amazing steps they are taking to fight human trafficking right here in Cbus. Thanks for being so stickin’ nice.